You pack*. We collect from school and deliver back to school before the start of the new term. You unpack. *If you’ve ordered one of our storage products, we'll deliver these to your house before the end of term. We unpack your school uniform. Check, name-tape and report back to you against the school list. We clean, repair and repack it. For just £21 extra, why not use our Duvet Cleaning Service and get your single duvet and pillow cleaned? A robust rigid plastic crate that folds flat for easy storage when not in use (space saving of up to 80%). Size: 600mm x 400mm x 330mm. 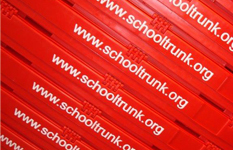 A disposable alternative to the School Trunk Crate, these cardboard boxes are ideal for single use and come with a roll of School Trunk packing tape. Size: 600mm x 400mm x 400mm. £12.50 for 3 boxes and £17.50 for 5 boxes. Please allow 3 full working days for delivery. An express (48 hour option) is available for a £10 surcharge. 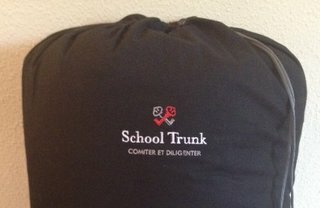 Unless otherwise agreed, School Trunk will deliver all packing products to the school 10 days before the end of term. Robust, reusable and breathable – an ideal bag for a single duvet and pillow.